Anti-Corrosion AISI 304 L stainless steel at full body structure. Most powerful pump brands such as Becker / Germany, DVP / Italy. Siemens and Schenider brands are used in pneumatic and electrical materials. Built with the hydraulic scissors lifting system. 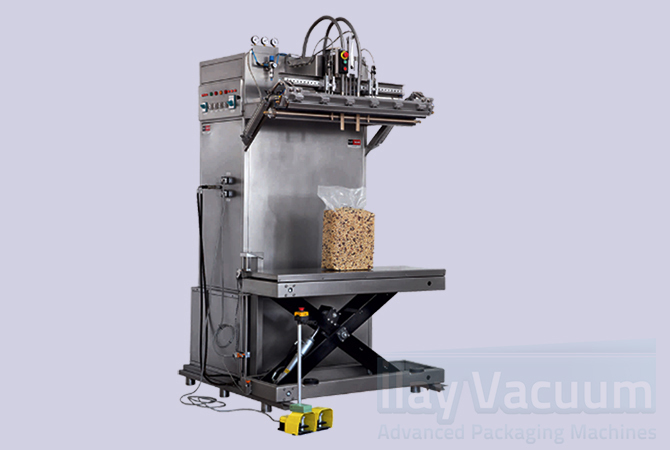 Lifting system is built to help and support operators when bagging 25-30-40-50-100 kgs of packs. The machine can be used for the packs with vacuum or without vacuum. Vacuum function can be deactivated. The capacity of the model starts from 5 kgs to 3000 kg. Nitrogen protection gas called as (M.A.P.) the gas unit is integrated into the model. The most important thing is that the product remains fresh in its own flavor and extends to longer shelf life.